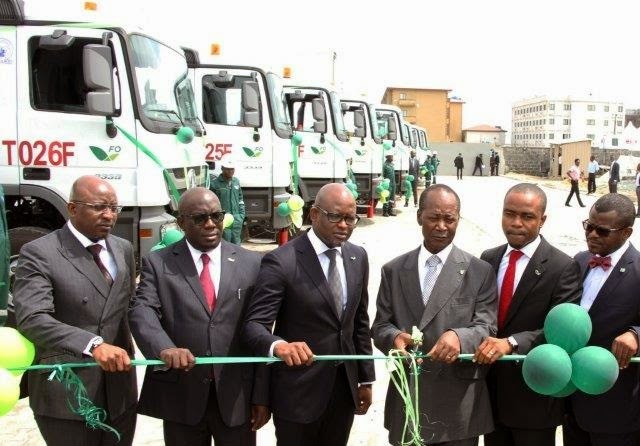 Forte Oil plc, Nigeria's foremost petroleum products retailer is proud to announce that it has acquired one hundred (100) brand new product delivery trucks in line with its strategy to sustain operational efficiency and attain exceptional product throughput. The Mercedes Benz trucks, which was financed through equity and debt provided by Heritage Bank, is a significant addition to the over 1000 existing trucks its fleet operations as the company takes an audacious step toward an unrivalled market dominance in the Nigerian downstream sector. Commenting Mr. Tunji Rabiu, Head Business Operations said: "As a distribution and marketing Company, we believe our customers deserve superior service delivery, which remains our major focus, in addition to operational efficiency. We're changing the landscape by taking this giant step of investing in large scale trucks acquisition and as such set a new standard for product distribution in our industry". Also Commenting, Mr. Akin Akinfemiwa, the Group Chief Executive Officer, Forte Oil PLC said; "We are very confident that the acquisition of these 100 world-class product delivery trucks is a very strategic investment that will substantially increase our capacity to grow our revenue, profitability and ultimately maximize value for our shareholders as we move towards our mission of building a long-term successful company; boosting investor confidence by making Forte Oil PLC the investment of choice in Nigeria and globally.